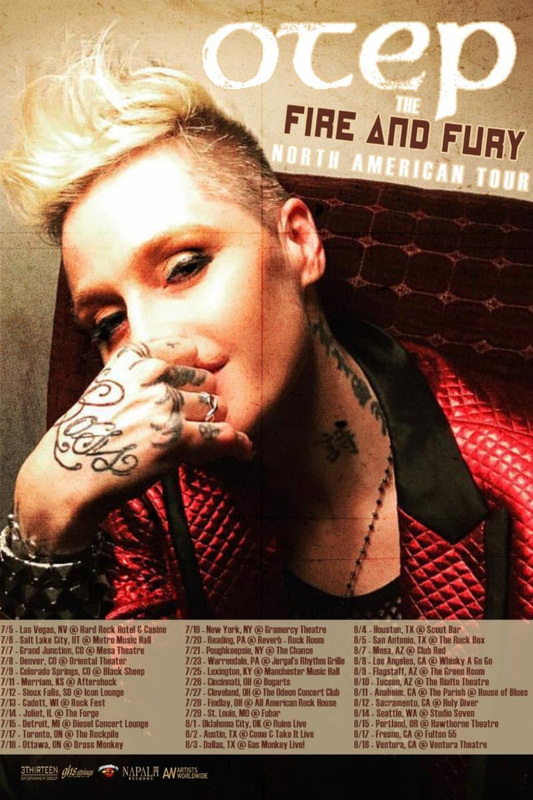 OTEP ANNOUNCES "THE FIRE AND FURY NORTH AMERICAN TOUR"
Iconic rockers OTEP recently announced the upcoming release of their eighth full-length album, scheduled to release later this year via Napalm Records. OTEP frontwoman Otep Shamaya says: "After every album there's an overwhelming sense of excitement, but this time it's in the stratosphere. This time, we hold nothing back. It's an uncompromising power-groove eruption of expert musicality destined to make some necks sore and spirits soar and with lyrical and stylistic freedoms which makes this feel like the most authentic album to date." OTEP is thrilled to announce that they will head out on a headline tour supporting the new album, beginning July 5th in Las Vegas, NV at the Hard Rock Hotel and Casino. The tour will run for nearly a month and a half, coming to an end in Ventura, CA on August 18th 2018. See below for all currently confirmed tour dates. Shamaya adds, "We are beyond excited to play some of the new songs on tour, to play Rock Fest in Wisconsin this summer, to scream and sing with our beloved fans and to remind everyone that no matter how hard they try to extinguish our identities, this time, we're standing together and fighting back. This time, they will know how powerful we truly are." 8/3 - Dallas, TX @ Gas Monkey Live!